Garden 2. Containers. – Dirty wet dog , boats and sailing. This is the second post in the series about my garden project and is a brief explanation of how i started gardening and the technique i carried over from my partners house. When we first came here the garden area seemed huge : that was partially what attracted us to the property and as you can see from the previous garden post it was a big project that took me most of 2 years to kick into shape. Before we bought this cottage we lived in a small terraced house with a much smaller outdoor space. From memory there was a small patio of about 13 feet square and then a strongly sloping garden of about 20′ by 13′. The site there was difficult mainly in the lack of space, the fact that all access was via the house only and that there was the barest skein of topsoil over a horrible mix of shale and hard clay. The advantage of the site for a first time gardener though was that it was small enough to play around with (bit like a small boat) and that the patio was a south facing sun trap. What i learnt to do there was to do my gardening almost completely in containers. I don’t have any pictures from that time as i hadn’t started playing with digital cameras at the time. Mobile display of spring flowers. Early crop of salad potatoes in the greenhouse. Salad greens and tomatoes/peppers in the greenhouse. I like to create a display of colour immediately outside the house as i think that really cheers things up. 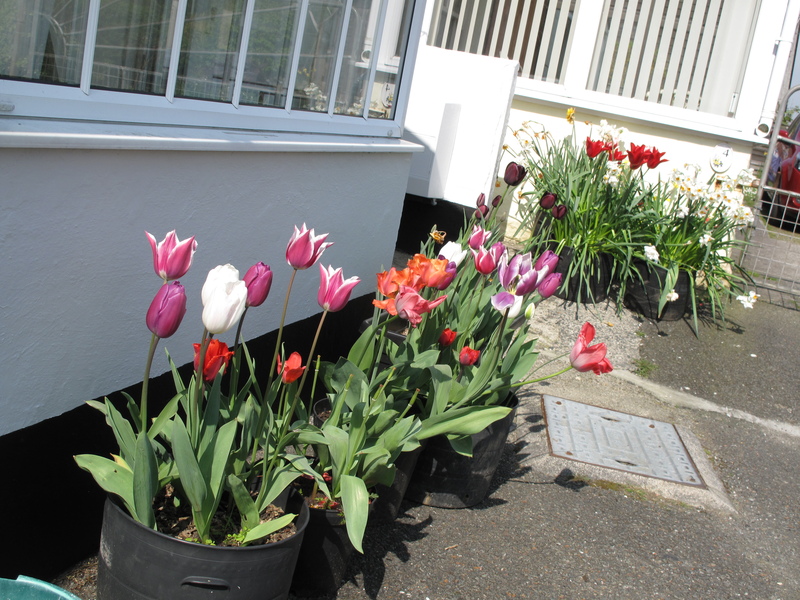 What i do now is have 2 ‘waves’ of planting and colour : first planting that comes through are the early spring bulbs so mainly daffodils and narcissi and as they come to the end of their cycle i replace those containers with new ones planted up mainly with tulips and then alliums. I have never succeeded with late summer bulbs !….no idea why. What that means right now is that i am emptying out last years containers into the deep beds, sorting and drying some of the bulbs and getting new containers ready to plant. Soon i will do my yearly shop for next years bulbs : i find that the tulip bulbs just don’t last very long and don’t mind the expense of buying a few packs. Old bulbs go back in the garden border or this year will go into the back garden project. Containers. At this time of year i am emptying, cleaning and sorting all the used containers so a lot of what i use are all together at the moment. I have mainly reduced to 2 sizes from one maker and these are sold as garden ‘planters’ but come undrilled : there are 2 sizes 30cm and 50cm dia. The smaller one is about the size of a decent builders bucket and will take one potato plant or half a dozen bulbs. The larger ones will do 3 potatoes or a tomato plant. I am gradually getting rid of the smaller plant pots as they get broken although this winter i may start my squash inside the house on a warming mat as they didn’t get a long enough warm season last time ( i will talk about them in garden 3) Container problems : my main problem here is that when i’m not around these small containers can dry out far too quickly but the plastic ones are much better in that respect than traditional clay planters which dry out within hours on a warm day. My current solution outside is that i mulch the soil in the containers with wood chip (running out of that now) and in the greenhouse i stand the containers (drilled) in gravel trays and keep some water in the trays. When i experimented with a whole container ‘farm’ out back i had an irrigation system in place which used hoops of soaker hose in each container all linked in a circuit : that works but was a lot of faff to manage. Container project next . The next stage in my container gardening here will be to use some old rain barrels as barrel gardens…essentially large containers for my strawberries. Right now i am moving some old empty barrels around to work out where best to site them. The plastic containers aren’t very attractive but at the front of the cottage they just blend in being black on black. Where they have to stand alone i tend to put them in these scrap timber planter boxes with a gravel tray in the bottom. That keeps the direct sun off them so they stay cooler and helps keep them watered. The hazel poles here were for growing peas or beans but works equally well for a standalone climbing plant.